Services introduce the aspect of ritual into our practice. Specifically, a “service” consists of a chant, performed in front of the altar, to transmit the energy, intention and benefit of our practice into the world we inhabit. In one way, rituals are an external expression of our inner state. At the same time, we strengthen and reinforce our inner state by the external chant. The service brings together what we think of as “inside” and “outside” into a unified whole. A service is the living manifestation of harmony within an individual, a group, and the atmosphere. In overcoming our personal preferences or self-consciousness about chanting, services show us that the secret to harmony is selflessness. 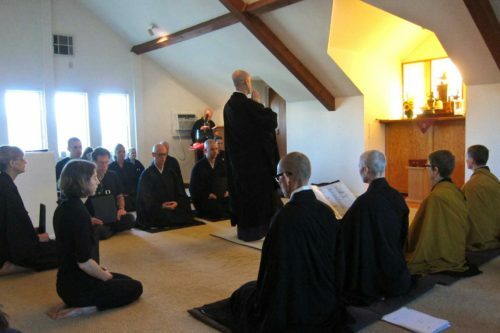 During a formal day of sesshin, services are performed in the morning, mid-day and evening. On a typical Saturday at the Hazy Moon, our morning practice period begins with services. Depending on the occasion or time of day, services chanted may include the Heart Sutra, the Identity of Relative and Absolute, one or more Dharanis, and the names of all ancestors in our lineage. Services are chanted to the accompaniment of a drumbeat and bells. Download a copy of our chant book for your use at home. Learning to perform various service positions is a natural part of one’s training at the Hazy Moon.